Herrity says bike coordinator job is "political statement position"
"I think there are still areas that we can become more efficient," Herrity said. For example, he said the county should eliminate what he called "political statement positions," such as the bicycle coordinator. I was disappointed to read in your November newsletter that you think Fairfax County should not have a bicycle coordinator. 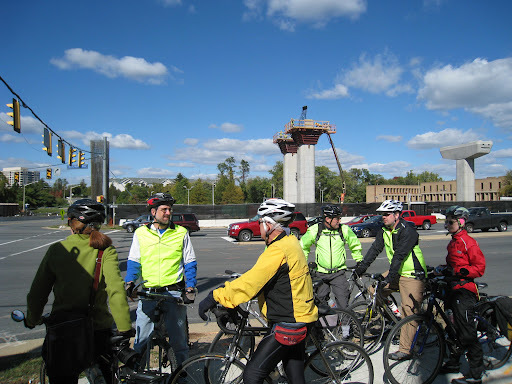 The coordinator works with VDOT to develop low-cost safe on- and off-road bike facilities. He reviews site plans to ensure adequate bike parking and safe bike access are provided. He produced the county bicycle route map, one of the most popular maps published by the county and a key safety tool for bicyclists. He worked with transit officials to get bike racks on all Connector buses. He is leading the effort to develop the first ever bicycle master plan for the county which will improve safety and access for all county residents. Every large city and populous county in the country has a bicycle coordinator. It is a critical position as local government’s take a hard look at how to address the inequity of the increased risks imposed upon those who cannot afford to drive, are without driver’s licenses or those who choose to travel by alternative modes. Local governments are realizing that they have been bearing the health and safety costs of not providing alternative transportation options which have resulted from the design of their infrastructure that blocks these options. The recent no-cost improvement on Lawyers Road which included bike lanes, decreased the crash rate for cars by 30%. We should be working to seek more of these low-cost options that benefit all residents. The bike coordinator plays a critical role in safe transportation for all county residents. As you know, the Transportation Advisory Commission agrees, awarding Charlie Strunk the 2009 Transportation Achievement Award at your Board meeting in June 2010. Instead of eliminating the bike coordinator position the county should be doing more to make Fairfax a safer place for biking and encouraging more people to use bikes for transportation so that the roads are safer for all. Please reconsider your position and support the bike coordinator position for the sake of the safety of county residents. We've also written to Supervisor Herrity about the shameful condition of the Jack Herrity Parkway (aka Fairfax County Parkway) trail. Herrity claims we have a good, connected trail system in the county and we don't need to spend any more money on bike infrastructure. See a photo of one section of the trail in this blog post. We never received a response to our earlier message. Please consider writing to Supervisor Herrity to let him know what you think about eliminating the bike coordinator position. McDougle, the Senate bill's patron, was riding in the Northern Neck last summer when he had a close encounter. "I was on a two-lane rural road and had somebody pass extremely close, so close that I had to move over, almost off the pavement," he said. "After that experience, a number of bicycling organizations came to me sometime later in the summer. I had a pretty good understanding of why they were trying to do it." "for a given amount of spending, bike lanes create about twice as many jobs as road construction." "Each $1 million spent creating on-street bike lanes directly creates 7.9 jobs and creates a total of 14.4 jobs when we include the indirect and induced effects," the author, Heidi Garrett-Peltier, writes, "The two categories of road repairs have the lowest employment effects, with 3-4 direct jobs and approximately 7 total jobs created for each $1 million." The final community meeting on the Tysons Bicycle Plan will be held on Thursday, February 17 at Kilmer Middle School, 8100 Wolftrap Road Vienna, VA, from 7-9pm. Cyclists are encouraged to attend to hear about the final draft of the plan and to provide comments. The draft plan, including maps of planned facilities for the four phases, should be available on the Fairfax County Bicycle Master Plan page a day or two before the meeting. See the Fairfax County News Release about the February 17 meeting. Below is a summary of the latest version of the Plan. Begin with a set of relatively low cost improvements. Focus on providing sufficient bike parking at the Silver Line stations, as well as convenient and comfortable bike access to and from the stations. Start encouragement programs. Focus near term bicycle-use promotion and route improvements on creating better access to and from the new Silver Line stations. Launch encouragement programs like "Bike-to-Lunch" and "Bicycle-Friendly Employer Awards." Plan, and implement over time, major new crossings of the Beltway and Dulles Toll Road. As routine accommodations, implement bicycle facilities in conjunction with development of new streets in the planned downtown grid. As the residential population grows in the core of Tysons Corner, ensure that new trails are aligned and designed to serve both transportation and recreation. Residential and commercial developers should also design bike-friendly buildings and sites and provide bicycle support facilities to make bicycle-use prominent, convenient, expandable and ultimately commonplace. In later years, transform even major arterials like VA 7, International Boulevard, and VA 123 by adding bike facilities that are separated from the road for priority cycling, shared use paths for lesser skilled cyclists, and signalization that facilitates safe multi-modal travel along and across these corridors. 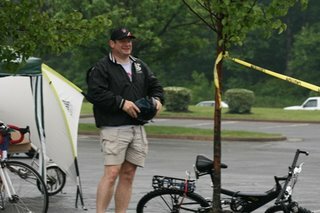 Fairfax County should implement bicycle parking requirements and require bicycle accommodations on private roads that serve public access. Bicycle-related Transportation Demand Management (TDM) requirements are critical to success. BikeArlington is an ideal model for Fairfax. VDOT should adopt typical urban travel lane widths, access management across sidepaths and refined intersection design standards. The Draft Virginia Bicycle Policy Plan is repeatedly referenced. program, full-service bicycle stations, and a bike sharing service. Bicycle safety education programs such as Safe Routes to School, and those directed toward motorists are also recommended. Implementation Phasing Maps - Maps depict planned facilities for each phase showing existing and future on- and off-road facilities, and spot improvements (mostly at intersections and interchanges). 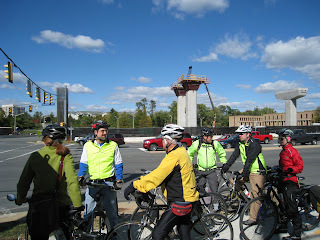 Three FABB members sit on the Tysons Bicycle Advisory Committee. We provided extensive comments on the plan and are awaiting the final draft so that we can develop a FABB position.We strongly support the latest version of the plan, provided our earlier comments are incorporated in the final draft. If you have questions about the lastest version, contact us. The Road to Happiness is the title of a film made in 1924 by the Ford Motor Co. It was filmed in Fairfax County, called Clay County in the film "to avoid offending the local populace." The purpose of the film was to promote improved roads. 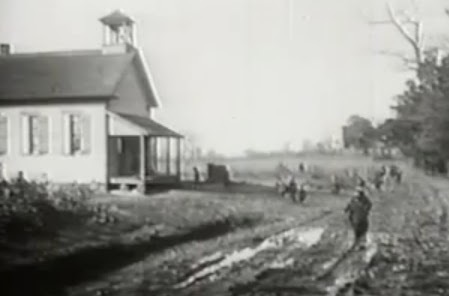 In an early scene, children walk along an unpaved West Ox Road to the original Navy schoolhouse, scraping their boots before entering. Later, the teacher encourages the students to enter the Good Roads essay contest. The Good Roads movement was sweeping the country at the time and the contest drew over a quarter of a million entries annually. One of the students wins and heads to Washington to be presented with a college scholarship by President Calvin Coolidge. The student goes on to study highway engineering, eventually returning home as the local County Engineer. Finally, we see children happily walking together on the newly paved road to the Navy schoolhouse. One pair of students drive a pony and cart to the school. That one-room schoolhouse has long since been replaced with an eight-hundred student facility while West Ox Road is a four-lane divided highway. Today, many children living short distances from the school cannot easily walk there. Sidewalks are missing in many locations and vehicles speed by the school on three sides. While in the past getting to school had fostered great independence, now many children are not encouraged to walk or bike there. This change in children's behavior came about in large part because of how we designed and constructed the surrounding neighborhoods and streets. Times have changed and we have realized some of what was lost in all those "improvements" that we built. Meanwhile, we can actually go back and restore some of the missing links through the VDOT Safe Routes to School Program. With SRTS funds, we can fix the non-continuous sidewalks, provide safety education and allow some more choices in how children can get to school. While we may not see many students arriving by pony and cart, it would be nice if a few more could safely walk and bike to their local elementary school. While the film is not online, a short clip about the film is on YouTube. Even though the three feet passing bill was defeated in the House, the Senate version, SB 928, was approved unanimously in the Senate and now moves to the House Transportation Committee. Please contact the Fairfax members of this committee to ask them to support SB 928. I am writing to ask you to support SB 928 which requires motorists to allow 3 feet when passing bicyclists. Three feet is a much safer passing distance than 2 ft for a fast moving motor vehicle overtaking and passing a cyclist. I personally have been passed by too closely by motorists on numerous occasions. The distance is easy to measure as well, being approximately one arms length. SB 928 passed the Senate by a vote of 40-0. Passage of the bill will encourage more courteous road use will be an opportunity to educate motor vehicle operators to allow for a wider margin of error when passing cyclists, and potentially reducing the number of fatalities and serious injuries to cyclists. Eighteen states, plus the District of Columbia, have now adopted three feet to pass bills. Similar bills are pending in 7 states. The League of American Bicyclists has adopted this standard as one of the criteria for designating a state or city as "Bicycle Friendly." Please support the bill. Update: WABA has posted a message about SB 928 with an easy way to send a letter to the seven committee members from Northern Virginia to ask them to support the bill. FABB was part of a group that recently gave a presentation on Safe Routes to School to the Fairfax Co Board of Supervisors. Below is a summary of the presentation. • The $13 million in SRTS funds available in Virginia, of which Fairfax Co has received $10,000. Supervisor Smyth stated that Marshall Road is unusual in that the I-66 ramp complicates access to the schools. The majority of the other Supervisors noted that similar problems exist at schools in their districts. Supervisor McKay pointed out that SRTS funds can help overcome some of these access problems. Supervisor Hudgins stated that if we did a better job of planning our schools and integrating them into the larger community we could prevent some of these problems. She also stated that the two Boards (SOB and SB) should have this as their goal. Supervisor Hudgins asked how SRTS applications are handled in other jurisdictions. For Infrastructure grants, it’s common for the Transportation or Public Works Departments to oversee the grants. Non-Infrastructure grants are usually generated and coordinated by the school system or private entities. The county has a list of needed sidewalk projects and we should look at these as possible SRTS grant candidates. Kathy Ichter, DOT chief, stated that DOT is OK with doing the engineering assessments for grants but they need the schools to coordinate. She suggested that the county should look at all schools and develop a priority list as the basis of future grants. Supervisor McKay said that we know some schools where we can start and we don’t want to wait for a long study before beginning the process. He also thought that schools must already have a travel plan that can be used to begin the process but we noted that the SRTS travel plan is more extensive and needs additional work including a parent survey. Supervisor Cook agreed with Supervisor McKay in that we know parents at some schools are ready to begin the grant process and we should begin there. Supervisor Cook also said that we ought to be flexible to get things implemented. Supervisor Hyland asked who makes the application. He also remarked that most PTA’s and principals probably don’t know that this program exists and that we should meet with them to get their support. We noted that we are beginning the process through Jeff Anderson’s contacts with the Fairfax County Council of PTAs. Supervisor McKay wanted to know who is the primary contact now and stated that we need to get the point person identified for this effort. Chris Wells, the DOT ped coordinator, and Doug O’Neill of FCPS are both doing SRTS-related work. Chris said that the schools set policies and these heavily influence SRTS activities. Supervisor Gross asked if grants can be used to fund maintenance such as adding ADA ramps, repairing damaged sidewalks and snow removal. If facilities need to be reconstructed, yes grants cover those costs. Periodic maintenance costs such as snow clearing or bike lane sweeping are not covered. Supervisor Smyth said we should be sure that projects selected are feasible and don’t require purchase of extensive right of way, tree removal, and other obstacles. Chairman Bulova said she would like to come out of the meeting with a decision on how to proceed. It was suggested that staff develop criteria for selecting schools and present to the Board, that DOT and FCPS meet to develop some operating procedures to figure out how to facilitiate the grant process. At a later date the larger SRTS community, such as the police, Health Department, other health advocates, and others can become involved in the process. Braddock District Supervisor Cook hosted a meeting last night on what can be done to make the area around Burke Centre Parkway safer for bicyclists and pedestrians. 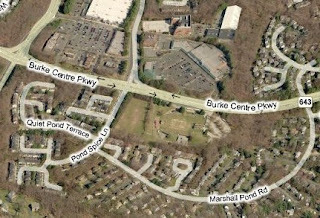 The road currently is a barrier between the more residential area south of the Parkway, that includes Terra Centre Elementary School, and Burke Centre and Burke Centre Village to the north. Andrew Lentz of Burke Walks - Safe and Green spoke eloquently about the desire of the surrounding community to safely get around on foot and by bike. He talked about his group's efforts to try to tame the Parkway and allow kids who live across the street from the school to walk or bike there. 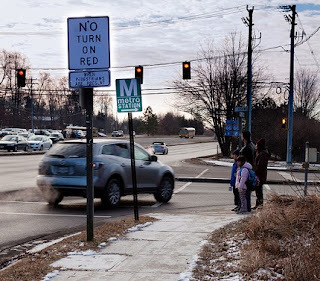 Fairfax County school policy is to prohibit students from crossing the Parkway. Students are bused who live within sight of the school. Representatives from VDOT, Fairfax County DOT, Fairfax County Public Schools, the Burke Centre Conservancy, and the Police were also present. It was refreshing to hear the new VDOT Northern Virginia District Administrator, Garret Moore, say that as public servants, VDOT staff should begin the discussion with citizens by saying "What can we do to help?" and not explain why they can't do something. He also noted that there is flexibility in the existing codes and regulations that allow for narrower lanes. Although he didn't say it, on a road like Burke Centre Parkway this could lead to slower traffic and allow space for bike lanes. We wish others had this same attitude instead of spending time during the meeting explaining why they couldn't implement measures to make it safer to cross the Parkway. Where it's difficult to cross the Parkway in front of the school, Police talked about writing tickets for jaywalking, which in Virgnia isn't illegal. School staff noted that their jurisdiction ends at the school property line, and any changes to the roads or surrounding sidewalks and trails must be made by the county or VDOT. Police summarized traffic citations issued for speeding violations on the Parkway between May 1 and October 28, 2010. There were 402 citations, 318 of which were for speeding. Of the 318 tickets, the majority were between 55 mph and 62 mph with an average speed of all violators of 57.9 mph. This is on a road with a 40 mph speed limit. There were also 14 crashes along the Parkway, which extends just under 3 miles in length. When concern was expressed about the speeding and number of crashes one officer said that the statistics should be put into perspective and that he didn't see anything unusual in these numbers. This just shows how much we as a society have come to accept the real danger involved in our use of cars. As another officer stated, the most dangerous thing you do all day is get into the seat of your car. The audience was very supportive of suggestions for slowing traffic and making the Parkway safer. Many were frustrated that the problem has been discussed for so many years without any solutions being proposed. Several suggestions were made for changes to the road. NOVA VDOT Administrator Moore suggested that a smaller group could be much more productive in studying alternatives and developing solutions. Supervisor Cook agreed to convene a study group/task force; what really a amounts to a smaller group of concerned citizens and staff, meeting a few times to develop possible solutions. This is a good step forward and thanks to Andrew and the folks at Burke Walks and at Burke Centre Conservancy for helping make the meeting happen and for getting to this point. Now it's time for solutions. Update: What I neglected to mention is the role that Safe Routes to School can play in improving walking adn biking conditions around the school. Through the program there are techniques for assessing the safety of walking and biking conditions around a school and developing solutions. The program was mentioned several times last night, and the Burke Walks folks have developed an application. Supervisor Cook noted that the Board is supportive of the effort and it's one solution to the problem. Which reminds me that I need to summarize the presentation that was given to the Board of Supervisors at their Feb. 1 Transportation Committee meeting. There was enthusiastic support for SRTS and a desire to move forward with a county application. Update: Here's the summary of the Board of Supervisors presentation. 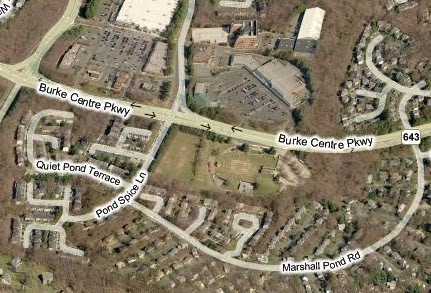 Update: Patch article on the Burke Centre Parkway meeting. The Senate version of the three feet to pass bill, SB 928, was approved by the Senate today in a unanimous vote, 40-0. Now it goes back to the House, where the House version was defeated in committee by a vote of 4-3. Newport News Delegate Oder, who voted against the House version, has indicated that he would support the Senate version after discussing the bill with VBF and others. No need to contact Delegate Oder; he has heard from cyclists. Update: We were premature in stating that the Senate passed SB 928 yesterday. It did pass the full Senate today. Two other pieces in the Post relate to creating safer streets, the editorial Red-light cameras get results "cameras saved 159 lives in the 14 cities over five years starting in 2004. If the cameras had been in use in every big American city, 815 lives would have been saved during the same span, the researchers concluded." and another letter to the editor More red-light cameras, please "I have changed my habits at all intersections since receiving a couple of fines from these so-called moneymakers, which wouldn't make any money if drivers obeyed the law. I encourage the installation of more of these, as well as speed cameras. It is time for drivers to slow down and obey the law. Driving is a privilege, not a right to cause harm to yourself, your passengers and others on the road." by Bob Stacy, Falls Church. Banks Neighborhood Park is located on Old Telegraph Road near Kingstowne and other residential areas and not far from Huntley Meadows Park. 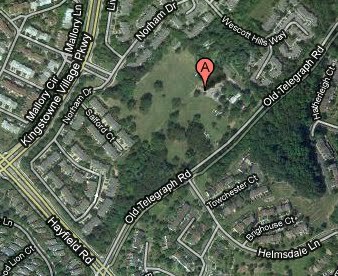 It's a 10 acre park owned by the Fairfax County Park Authority but it "is not currently open to the public as it contains a life estate provision for Mr. Olander Banks Sr." The Park Authority has developed a draft master plan. A Public Comment Meeting is scheduled for February 17 from 7-8:30pm. Unfortunately that's the same night as the Tysons Bicycle Plan public meeting. If you're not planning to attend the Tysons meeting, cyclists should consider attending the Banks Park meeting to ensure that bicyclists will have safe, convenient access to the park with adequate bike parking. Read the Draft Master Plan. According to folks at Virginia Bicycling Federation, the Senate version of the three feet to pass bill, SB 928, passed the Senate Transportation Committee by a unanimous vote this afternoon. It will now move to the full Senate. If passed it will then be sent back to the House Transportation Committee where we've heard there's a chance it could pass. Check the VBF site for action alerts. If you want to see an example of how the Virginia legislature works, Bike Charlottesville has posted a video of the committee meeting in which House Delegates debate HB 1683, the bill to require motorist to allow three feet when passing a bicyclists. It's a little discouraging to see that people who write our laws know so little about the existing laws, at least as they apply to bicyclists. Several times it's stated that cyclists cannot ride two abreast whereas the law states: "Persons riding two abreast shall not impede the normal and reasonable movement of traffic, shall move into a single file formation as quickly as is practicable when being overtaken from the rear by a faster moving vehicle, and, on a laned roadway, shall ride in a single lane." 46.2-905. Another legislator states: "Is there any requirement for a bicyclist to ride on the right hand side of the road?" The code states: "Any person operating a bicycle, ... on a roadway at less than the normal speed of traffic at the time and place under conditions then existing shall ride as close as safely practicable to the right curb or edge of the roadway, except under any of the following circumstances:" 46.2-905. Bud Vye of Virginia Bicycling Federation did a good job of setting the record straight, albeit after the bill was defeated. There's also an interesting discussion with Del. Toscano outside the committee afterwards. Tim Rosato was there representing FABB. Virginia House Transportation Subcommittee 2 deliberates HB 1683 Jan 26 2011 from Heather Higgins on Vimeo.